As people understand the gospel and experience the truth that God, through Jesus, by the Spirit, has included them in his love and life, they begin to see God and themselves in a new light—they begin to believe. The Spirit leads disciple-making churches to nurture believers. We Believe – a comprehensive tool for teaching all age groups the core beliefs of our Christian faith. The Basics for New Christians – a less comprehensive tool for teaching adults and older teens. 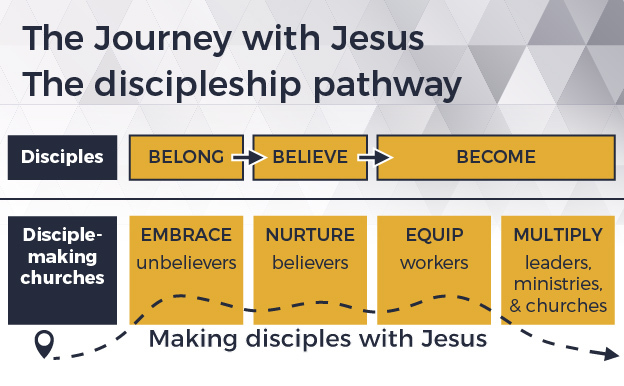 Discipleship 101 – a discussion-based tool for teaching Christian doctrine. Ready, Set, Grow – a resource to help you start and facilitate small groups. Age-graded resources – links to tools for discipling all age groups. Kingdom Life Studies – a video-based Bible study curriculum that explores Christian living. Discipleship Explored – a discipleship course that uses videos. Worship Resources - a page on this website with multiple worship-related resources. Worship, Community & the Triune God of Grace - a book by J.B. Torrance on the theology of worship. Small Groups Starter: Ready, Set, Grow - a resource to help you start and facilitate small groups. How to Build a Small Groups Ministry - a book by Neal McBride. FaithTalk equipper - a GCI website with resources to use in starting then facilitating small groups that include both believers and unbelievers. How to Deliver Effective Speeches - examining basic public speaking skills. Biblical Preaching - a primer on this topic by master-preacher Haddon Robinson. Five Most Common Mistakes Made by Preachers---short videos from master-preacher Frank Thomas. To watch on YouTube, click here, here, here, here and here. GCI articles about personal money management. A Christian View of Money - a book by Mark Vincent.